Cannoli: Cannoli are Sicilian pastry desserts. 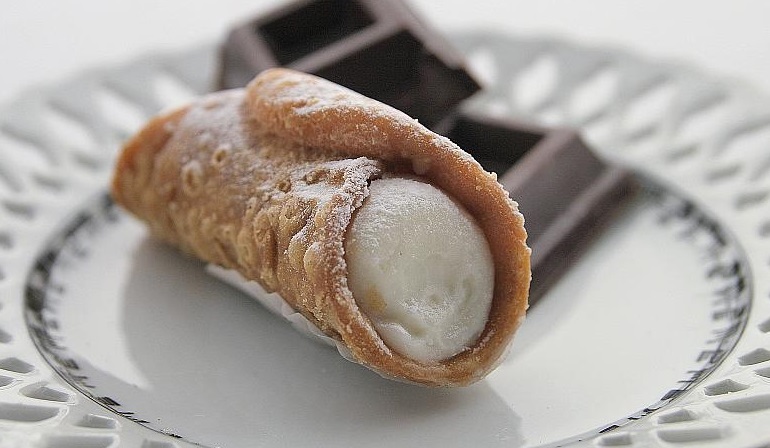 The singular is cannolo (or in the Sicilian language cannolu), meaning “little tube”, with the etymology stemming from the Latin “canna”, or reed. Cannoli originated in Sicily and are a staple of Sicilian cuisine. They are also popular in Italian American cuisine. In Italy, they are commonly known as “cannoli siciliani”, Sicilian cannoli. Cannoli consists of tube-shaped shells of fried pastry dough, filled with a sweet, creamy filling usually containing ricotta. They range in size from “cannulicchi”, no bigger than a finger, to the fist-sized proportions typically found south of Palermo, Sicily. Note: Cedro is the glacé fruit of the citron tree. It’s available from good delicatessens; if it’s unavailable, substitute candied lemon peel. Combine flour, granulated sugar, cocoa powder, cinnamon, and salt in the bowl of an electric mixer. Add in the Marsala wine and oil. Beat on medium speed until dough comes together. Using your hands, knead dough on a lightly floured work surface until smooth and elastic, takes about 15 minutes. Wrap in plastic or polywrap, and let rest 30 minutes. Pass 1 piece of dough through the widest setting of a pasta machine (keep remaining pieces covered) OR roll out into a thin sheet of dough. Continue passing through narrower settings until it is the thickness of a dime. Lay on a floured work surface. Cut out rounds with a 3 1/4-inch cutter. Heat over medium heat until a deep-fry thermometer registers 380 degrees. Wrap each round of dough around a 3 3/4-inch-long cannoli form, sealing with a dab of egg white. Working in batches of 3 or 4, fry until golden, takes about 1 minute. Using a wire skimmer or tongs, transfer the fried cannoli to paper towels. Let the fried cannolicool 5 minutes. Carefully slide out forms, and let shells cool. Continue rolling, cutting, and frying the remaining dough. Process ricotta, Marsala wine and icing sugar in a food processor until a smooth consistency is achieved. Spoon into a piping bag fitted with a 1.5cm star nozzle. Pipe the ricotta filling into cooled cannoli. Dust the cannoli with icing sugar. Cannoli cannot be made and filled ahead of time the shells will get soggy. You can however, make the shells and cream in advance then pipe them right before serving. After making the shells store them at room temperature in an air tight container for up to 4 days.